On April 21 last, during the freak storm, one of Norfolk’s few remaining fine old flour mills was struck by lightning, that at Sutton, Norfolk. After the war, when our visitors return to the rivers and Broads, many will regret the fact that fewer still of the mills are still in running order. East Anglia, like Holland, has always been noted for its windmills. Dotted all over the marshes, they added a unique charm to the scenery. Unfortunately they are fast becoming a thing of the past. At one time nearly every village had its flour mill, where local grown wheat was made into flour and most of us who can remember bread made from“stone-ground” flour must appreciate its infinite superiority of flavour compared with the present bread. The old type of miller was very conservative and independent, and farmers had to go to him for grist work. They took great pride in their mills and were particular, to a degree, that everything was spick and span. During my apprenticeship I well remember it was almost a crime to leave chips lying about. If we were wheel-gearing, sacks had to be spread on the floors and, when working outside, my last job before leaving was to see that all chips and shavings were cleared away. The riverside mills were, of course, used for marsh drainage, although one was used for grinding mud for the manufacture of cement and one was fitted with a saw bench. (Perhaps this is the origin of the term “sawmill”?) Fourteen of these mills stood on the banks of the River Bure between Yarmouth and Acle bridge. These, alas, are now all out of action. I wonder if any of the present generation ever give a thought to the amount of work entailed in the building of a windmill? How much weight there is at the top? The distance from tip to tip of the sails and the “drift” of the sails to give them pulling power? 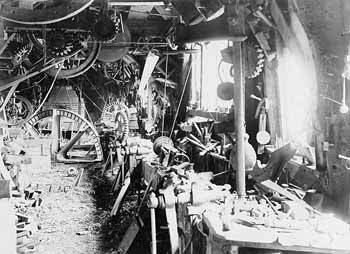 Nearly all gear-wheels are wooden cogged, but the conscientious work put into them by the millwright and his selection of wood gave them a life equal to iron. I know of wooden-cogged wheels that have not been renewed for 50 years. The woods used were apple, hornbeam and beech. In some of the older mills, up to a few years ago, there were wheels known as“whole and half-lantern”, one wheel fitted with spokes and the other with trunnels. The modern engineer would be amazed at these wheels and probably ridicule them, but they are their own testimony to efficiency and endurance. Somerleyton, and standing on Herringfleet Marshes. This mill is worthy of more than a passing glance, and its caretaker will proudly boast that it can still hold its own against any of the “new fangled pumps”. Mautby Mill had brickwork at its base three feet thick, while at Oby, just above Acle Bridge, stands a mill that bears the date of its erection, 1797. There were several types of mills known professionally as cloth sail, patent sail, and skeleton. Lord Somerleyton’s mentioned above is a cloth sail, ie the sails are fitted with a framework on one edge and a canvas is stretched across the sail when ready to run. This particular mill was erected before the innovation of winding gears, or “curbills”, and has to be pulled round by hand so that the sails are face on to the wind. With the passing of the windmills those super craftsmen, the millwrights, are also becoming extinct– Smithdale, Martin, England (of Ludham), England (of Yarmouth, with whom I served my apprenticeship), Rust, Barnes and others - but the few mills still turning are worthy memorials to their conscientious and efficient craftsmanship. The work of a millwright could be very risky at times, and most of us have taken a fall at one time or another. On one occasion, while removing a striking rod, I fell from the “fly-stage”, struck a forked wheel at the start, cutting my eyebrow, but landed, on my feet and was back on the fly-stage within 10 minutes with nothing worse than a cut eyebrow and a severe“choking off” from the guv’nor for being careless. This fly-stage was a matter of 30 feet from the ground. A fellow worker fell the same distance and landed in the mill dyke. His only complaint was that he didn’t like the taste of the water. Apart from the disappearance of these picturesque landmarks, it appears that a new system of drainage is being established which is, obviously, more effective. Most of the windmills had water wheels which would start lifting as soon as the sails were in motion, and except for the cost of upkeep the costs of running were negligible. Seven pounds of grease and half a gallon of oil would keep a mill running smoothly for 12 months. Turbines are a comparatively recent innovation, the first being installed by Messrs. Whitmore and Binnon. I am still on marsh drainage work, but my interest in the mills with which I have been intimately associated for nearly 50 years is undiminished. 9 Robert Briggs jnr -1761 to 1768.